Both the ear's sensitivity and its selectivity—its ability to distinguish different frequencies of sound—depend crucially on the behavior of a minuscule gelatinous structure in the inner ear called the tectorial membrane, which Freeman and his students have been studying for more than a decade. Now, they have found that the way the gel membrane gives our hearing its extreme sensitivity has to do with the size, stiffness, and distribution of nanoscale pores in that membrane, and the way those nanopores control the movement of water within the gel. "Mechanically, it's Jell-O," Freeman says, describing the tiny tectorial membrane, which is thinner than a hair. Though it's essentially a saturated sponge-like structure made mostly of water, "if you squeeze it as hard as you can, you can't get the water out. It's held together by electrostatic forces," he explains. But though there are many gel-based materials in the body, including cartilage, elastin and tendons, the tectorial membrane develops from a different set of genetic instructions. The purpose of the structure was a puzzle initially. "Why would you want that?" Sellon says. Sitting right on top of the sensitive sound-pickup structure, "it's the kind of thing that muffles most kinds of microphones," he says. "Yet it's essential for hearing," and any defects in its structure caused by gene variations can significantly degrade a person's hearing. "It's tuned just right to get the signal you need," Sellon says, to amplify the sounds that are most useful. The team found that the tectorial membrane's structure "looked like a solid but behaved like a liquid," Freeman says—which makes sense since it is composed mostly of liquid. "What we're finding is that the tectorial membrane is less solid than we thought." The key finding, which he says the team hadn't anticipated, was that "for middle frequencies, the structure moves as a liquid, but for high and low frequencies, it only behaves as a solid." 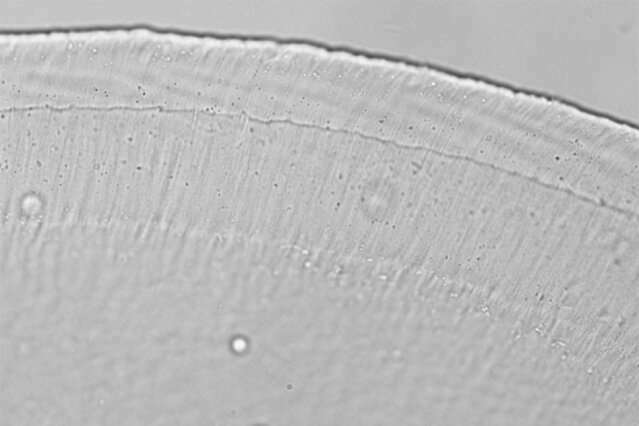 Overall, the researchers hope that a better understanding of these mechanisms may help in devising ways to counteract various kinds of hearing impairment—either through mechanical aids such as improved cochlear implants, or medical interventions such as drugs that may alter the nanopores or the properties of the fluid in the tectorial membrane. "If the size of the pores is important for the functioning of hearing, there are things you could do," Freeman says. of the department of otolaryngology at the University of Southern California, who was not associated with the research. "The mechanical nature of the nanoscale structures of the inner ear is extremely hard to study but critically important to hearing. In this study, the authors show that the proteins within the tectorial membrane and the fluid interspersed between them are 'tuned.' This may finally explain how each hair cell is stimulated at its correct frequency." Oghalai adds, "this research is of the highest quality. Not only were exquisite experiments performed, the data were modeled mathematically to develop a deep understanding of their implications." One thing that remains to be done, he says, is that since these tests were done on excised tissue, "it remains to be seen whether these findings are relevant in the normal inner ear of living animals." More information: Jonathan B. Sellon et al. Nanoscale poroelasticity of the tectorial membrane determines hair bundle deflections. Phys. Rev. Lett. In press. The ear, eye, nose, and tongue compete for the most exquisite sensory organ. I'm glad the authors didn't go down the path of trying to give credit to random processes for the creation of such amazing magnitude. Yes,it is right the deaf year can not receive sound of outside. But it can receive the sound of blood flow in our nerves.It can also forecast the heart and blood pressure. as a long term geriatric lab rat I have observed tinnitus change in frequency 17Hz to 3kHz with age now 76 and tinnitus semi dissapeared due to slight deafness.